I debated whether or not to post about this, but when I shared it on my personal Facebook page, I received such a positive response (particularly from fellow mommies), that I decided I should share. Here’s the deal: We have too many toys. My kids have been spoiled. And before I write one more word let me just say that I am fully aware of what a ridiculous “first world problem” this is. I know. The thing is, somewhere along the line we started accumulating “stuff.” Please don’t misunderstand and think that we don’t appreciate what we have — we do. I’m just tired of the mess, tired of the clutter, and craving more simplicity. 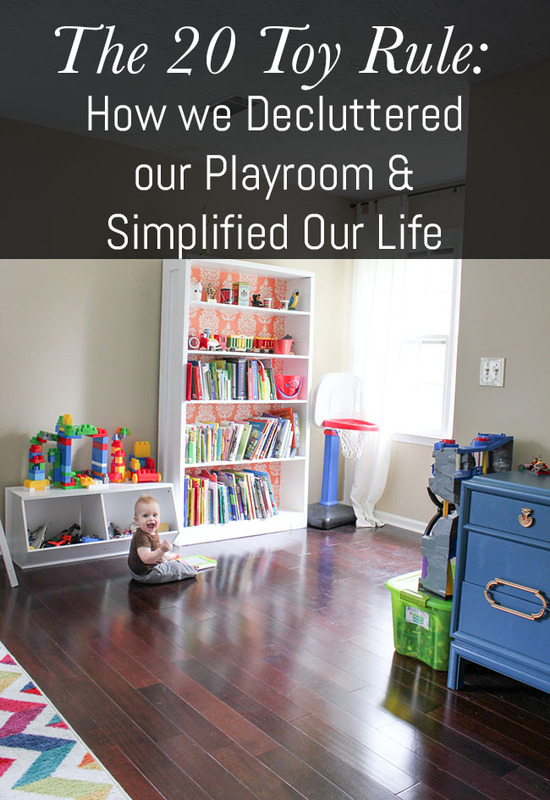 Our playroom had become a cluttered mess that was impossible to keep clean. Just the idea of cleaning it had become overwhelming, not only to my children, but to me too. Every square inch of the floor was constantly covered in toy bits and pieces. We have a front and back staircase in our house, both of which we use equally, but you have to pass through the playroom to get to the back stairs. 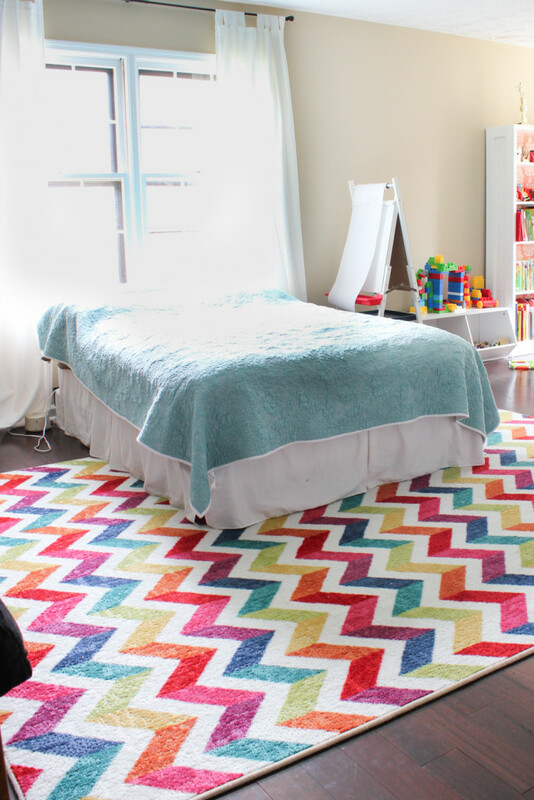 We also use the playroom as a backup guest bedroom, so we can’t be hopscotching through a Lego minefield every time we attempt to traverse the room. (Of course, I didn’t think to shoot decent photos before the room was cleared, but I did snap a few with my iPhone during the process, so please excuse the picture quality.) These photos don’t even capture the worst of it! This was about halfway through the decluttering process. Here’s how we decluttered: I told my boys that they could each choose 20 toys to keep. At first, they panicked, but they quickly realized that there were tons of toys in bins and on the floor that they rarely even played with, and the mess was making it hard for them to find things or even see what they had. They quickly conceded that it was a decent idea, and they spent time thoughtfully choosing which toys meant the most to them. I gave them a couple of days to slowly form each of their piles of 20 items. There were a few caveats: Legos, Playmobil, art supplies, blocks, books, and Jake’s beloved squinkie collection didn’t count toward the total. (Although they were required to organize all of these items.) These are the things they play with the most, and since there are so many tiny bits it just didn’t make sense to include them. We did organize them into designated bins/buckets, and they were instructed to keep them put away at all times when not in use or they will get taken away. (This is not only due to the mess factor, but also as a safety precaution for their crawling baby brother.) We keep art supplies in the blue dresser drawers, and a couple of small bins full of pens and crayons on their art table in the corner of the room. Drawings get hole punched and filed in binders. Miscellaneous toys (action figures, etc.) go in our beloved white toy bins. I found them at Target — we have 3 of them and they each are divided into two sections. (I couldn’t find the exact same ones available now, but these are the same in an Espresso finish, and they also have single storage units.) We keep our sports equipment in a big tub like this one. I mean, are you seeing all of this glorious floor space? So here’s the plan: For now, the storage bins are stored in the basement. I want to give it a little time before I give them the permanent boot, just to make sure that we don’t hastily get rid of something that might have sentimental value. In a few months, the majority of the toys will get donated, while some will stay in storage and be periodically swapped and rotated in and out of the playroom. From now on, every time the boys get something new, they will donate something old to make room for it. So, how’s it going so far? We’ve lived this way for about a month now, and so far, so good. They’ve only asked for a swap one time when they realized they’d like to have a few of their superhero action figures in exchange for some lesser played-with stuff. And you know what? They don’t miss the clutter any more than I do. They didn’t cry or whine, and they genuinely seem to be enjoying all of the extra space in the playroom, along with the fact that clean-up only takes about 10 minutes per day and they can much more easily find whatever it is they are looking for. 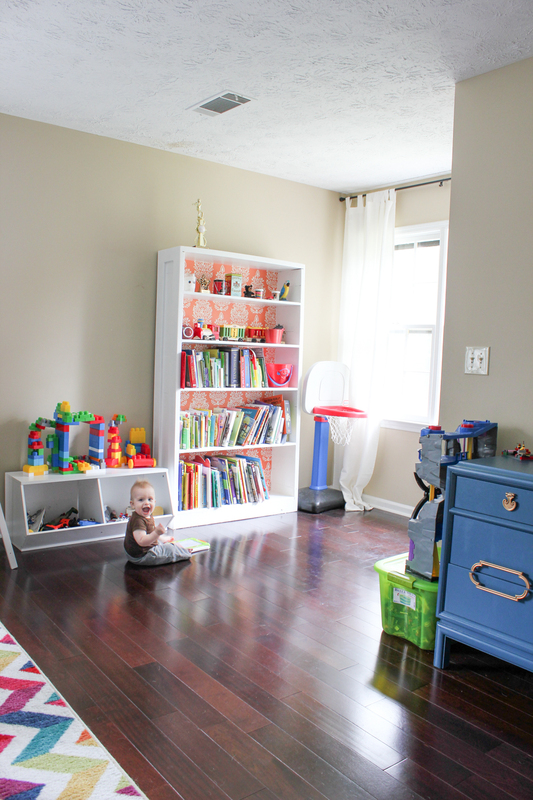 There is plenty of free floor space now for baby Jonah to crawl around, plus we just moved a bed into the room to create a secondary guest bedroom/playroom combo. (More room updates and plans for the room coming soon.) A few extra toys have crawled out of the woodwork since we put the storage bins away, so we will have to revisit the toy situation again soon and pare down even more if need be. My advice for you if you plan on doing something similar, is to modify it to fit your family’s needs and goals. Maybe 20 toys isn’t the magic number for your household, or maybe it is and you don’t even need to create as many caveats as I did (as far as making exceptions for Legos, etc.). The goal is to simplify, and I think you and your kids will both be pleasantly surprised by how much they enjoy having fewer things to sift through when trying to find specific toys to play with. I plan on decluttering the entire house little by little. And while it may be time consuming upfront, it is well worth the time saved cleaning and organizing in the future, and the freedom we will feel when we break free from the “stuff” that has been ruling our lives. So tell me, how do you stay organized? I can use all the tips I can get! LOVE this. My son has a million stuffed animals. I want to try this at our house! Oh yes, the stuffed animals were out of control here too! I forgot to mention that in the post – I let them each choose 5 stuffed animals to keep out of storage and those are in their bedroom. Finally! I did this with my twins years ago. The swaps are great especially in the winter when they can’t play outside and are bored. Just before Christmas I would pull out all their toys and we would go through them to donate. They did not mind because they knew they were getting new ones from Santa. Great idea! I think swapping the toys out is a great idea. Hopefully it will work well for our family! I love this. I did something similar with my now 6 year old daughter when my almost 2 year old was due. We went through all of the “baby” toys and got rid of a lot. I just packed up her barbies after she said she didn’t want them anymore. But those will most likely go to storage than the donate/sell pile. But… I need to do this with our living room. The duplos, blocks, and little people are taking over and I’m sick of it. I’m done with the some stuff but know my son still plays with it. So it’ll stay until his birthday or Christmas when I’m sure something better will come along and then he won’t miss some of the older toys. I feel your pain! Toys were getting scattered all over the house and it was driving me crazy! Of course there are still toys here and there, but nothing like before. We had let it get way out of control! When my babies were, well, babies, we would box toys and rotate them in and out. When kids would get bored and start asking fir toys on TV it was time to rotate! Great idea! We definitely plan on rotating too. I think it will work out well for our boys. The clutter was just getting out of control! Great idea! Storing the toys is definitely a problem. While the child is growing, the mountains of toys get bigger and bigger. The whole house looks so much better & clean after the de-cluttering. Thanks for sharing this awesome idea with us! Thank you! Yes, the mountains of toys definitely grow with the child! Keep flexing that mommy muscle. It makes both you and your kids healthy. As a Certified Professional Organizer, some of my saddest situations are working with 20 year olds who never learned to part with things, clean their rooms (apartments as they move out) and take care of their stuff. Sharing your great article. How do I work around having toys at my house for grandchildren who are boys and girls in ages 6 months to 11 years? I need help. The small bedroom is not currently even usable. I would definitely look into buying furniture that can serve a dual purpose or provide storage, such as a storage ottoman at the foot of the bed (if the bedroom doubles as a playroom), or an armoire that can be for toy storage only. I would also add shelving or organizers in the closet that will maximize the storage space in there. When you lack floor space, think vertical. Use your vertical space to the maximum by adding shelving or tall bookcases with baskets or bins, labeled according to type of toy or with names of which child the toys belong to. I would have the older kids’ toys higher up on the shelves and the baby toys down low within reach. 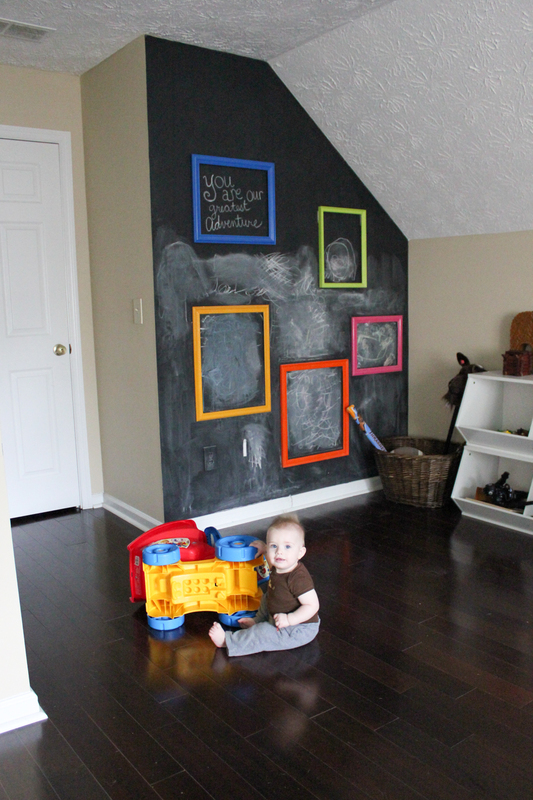 Be sure to anchor any heavy pieces of furniture to the wall if you have babies or toddlers who may eventually climb. Just a few ideas! Hope this helps! Oh, those bins that side under the bed are really great too. The clear totes that are large and flat. We love those! *Slide under the bed. Pardon my typo! I feel your pain! We actually just started putting a playroom together because the toys in my living room drove me bonkers. I haven’t started sorting yet but I know we have way too much stuff. Because my little guys have FASD, we really should be minimizing the choices or they do nothing but dump and throw toys at each other. I like the 20 toy rule…think we need to give that a shot. You’re playroom is gorgeous, btw! Thank you, Jenna! Good luck organizing. I know it’s such a process sometimes! Hope the 20 Toy Rule works for you! I love this so much! It is my slow season right now and I have been spending time going through my house right now room by room. This sounds exactly like my daughter and my home! Thanks for all the helpful suggestions! Thanks so much, Katherine! I’m so glad you found it helpful! Where did you get that rug? Hi Natalie! It’s a Mohawk rug and they sell it at Target and Overstock. I think it’s called the “Mixed Chevrons” rug. Hope this helps! Last year I got so mad with the toy clutter that I took away almost everything and stashed it in the garage and my son had to earn and ask for toys bit by bit. Just last week, we went on holidays and only took a few things for each kid (they’re 6, 2 and 8mo), and life was so much happier. We talked to our eldest about how he felt with fewer toys and he said he felt better. He played better and was happier (by observation). Clean up time was so simple; no arguments, no tears, no overwhelmed kids, no cranky parents. I loved it. We came home and immediately started decluttering (is there something wrong with us?! Haha!) Bit by bit, we’re decluttering our home to make life “less stuff, more enjoyable”. I personally find mess and clutter overwhelming and stressful, and it definitely effects my household when I’m stressed, so I think it’s a good move all round. I like the 20 toy idea, with the extra limits; I think my son would respond really well having a limit and that ability to choose his stuff, and it means that I can set some boundaries too. I’m going to work with him on the 20 limit, and do the same with my 2-yo stuff. Great post. Thanks Kat! I totally know what you mean about clutter causing stress. I feel the same way! I am going to try this today! I have a 3 year old and an 8 month old. They have toys in the ivingroom & their playroom. Most of the toys are from my 3 year old and with Christmas coming I’m scared to see how things will look! I know it can get overwhelming with so many toys! Hope this method works well for you. Love this! The toys have taken over our living room and I am so overwhelmed at the thought of Christmas. My son is only 2 1/2 and baby brother is coming in March. We are going to convert our guest room into a guest room/playroom combo but I know we need to pair down on the stuff. So when you said 20 things… You literally meant like 5 super heroes, 5 of x, y and z? I am not sure how to do it. Should every Little People figure and animal count towards the total? Just trying to figure out a good way to do this. Any input is welcome! Hi Alie! Congrats on the upcoming addition to the family! There were certain things that I made exceptions on. For example, blocks, Legos, and books didn’t count toward the total. But yes, each action figure counted, along with vehicles, etc. We actually need to do this all over again before Christmas because things accumulate throughout the year, and we’ve built up quite a collection again. I would say do what works best for you though. Maybe little people count as one item if that’s something your son plays with often. 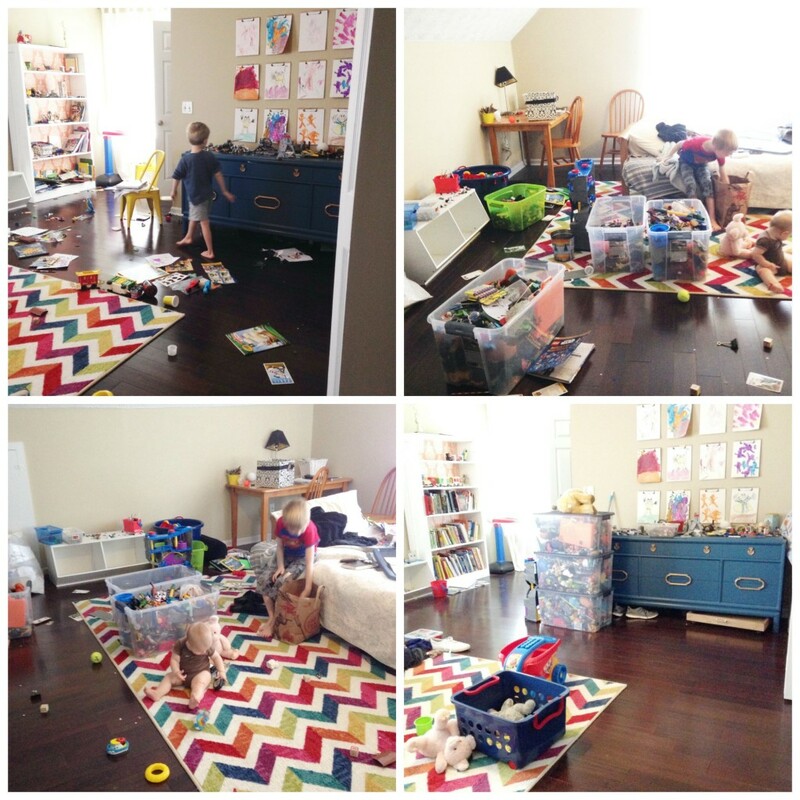 My main goal was to eliminate the clutter that takes up space but our kids rarely even played with. After a while it just becomes “stuff”. They have their handful of favorites that they play with the most, and I wanted to guide them toward keeping those around while eliminating all of the other stuff that just takes up space, if that makes sense. You could always keep it in a tote and rotate toys in and out every few weeks too just to save space but to also reassure your son that those toys aren’t going bye bye forever. Good luck! Good luck!! I know it’s a challenge. You can do it, mama! Thanks Monique! So glad you are avoiding meltdowns! Clearing the clutter really is so freeing. Hi Leanne! It’s a Mohawk rug and they sell it at Target and Overstock. Hi, just came across your post on Facebook. I have 4 (3boys). What do you think is a good idea/rule for keeping toys for the younger boys. My oldest boy is 9. Then 4 and 1. My daughter is7. I am really ready to start minimizing toys but struggle with not knowing what the little boys will like as they get older. Was thinking about boxing some things up and storing them at the top of closets. We downsized a year ago by 1000 sq feet so things are starting to feel overwhelming. Hi Jaimee! I know that’s so tricky. I would keep some staple items like cars/trucks, action figures, etc., but I think a good idea is to rotate toys in and out and just see what they seem most drawn to. Then pare down over time. Good luck! MUst share with my daughter of the same name. I could almost say you are her. Hopefully this will help her. Thank you! Hope she found it helpful. Good tips for finding which toys you should keep and which ones should go. I will definitely have to remember these tips. Thanks so much for sharing. I don’t have any storage space to rotate toys out…no basement, attic, extra closets, outside storage…no where. I’m about to simplify big time because we are now about to have baby #2 and our first child has TONS of toys. So how do I address this issue? If you have nowhere to store them, you might just consider purging and donating them. Keep the essentials/favorites and simplify by going in a more minimalistic direction. Good luck, and congrats on baby #2! Our playroom is the room that is supposed to be the dining room and is right in the front of the house so we try to keep it somewhat neat. I’m currently working on redoing this room but here is my general rule as far as toys go. The bigger items like tool bench and kitchen are in the playroom. He also has a bookshelf with puzzles and musical instruments and a small table. The rule is if Mommy has to pick it up it goes away in the closet for a week. This usually keeps things put away by the end of the day (we take about 5-10 minutes to clean up before dinner usually). In his bedroom he has a bookshelf and toy box and that’s it. If it doesn’t fit in there it gets packed away up on a shelf in the closet. We rotate the toys every few months. There is one big plastic bin in his closet with toys that we will rotate in the toy box. He has a few special items in the closet such as marbleworks, legos, and kinetic sand. These can only be used while supervised (he’s 2.5 and sometimes still puts things in his mouth) and I often use these as special rewards. We try to mostly keep the toys contained to these 2 rooms. What a amazing article! Thank you for sharing this! I was just saying today that the clutter is overwhelming. mine is 4 and within the last year the little toys have doubled, if not tripled. and with Christmas coming, its making me so stressed and causing my anxiety to fly up! Great article and we have discussed and will be doing this tomorrow. Good luck! I’m glad you found my post helpful and I hope this strategy works for you! I am so glad you posted this. It feels like there’s always a struggle to put the toys away. More is definitely not better. We are lucky that we can provide four our two girls but it’s overwhelming when you live in a small space and toys of all things take over. This was a great lesson to all of us. Thank you for sharing! Love the post. Are the inside of the shelves painted or contact paper and where did you get that rug? It’s amazing!! Thank you! The shelves are lined with removable wallpaper from Wallternatives, and the rug is Mohawk Home. They carry it at Target and Overstock. I’m so glad to see you’re still answering comments several years later. 🙂 My question was, 20 toys per kid, or 20 toys total for the family? My 3 boys share a large bedroom which often gets pretty messy like this. The funny thing is, they rarely play with the toys in their toy bins. I’ve thought about just removing them from the room without saying anything, but want to give them the option of removing a few things they really like. Those cubes that fit inside the cube bookcases are terrible for sucking toys in that never get played with. Actually, I feel like as I type I’m answering my own question. 🙂 Thanks for the great article and the lovely pictures! I pinned it. We do 20 per kid. Thanks for pinning!